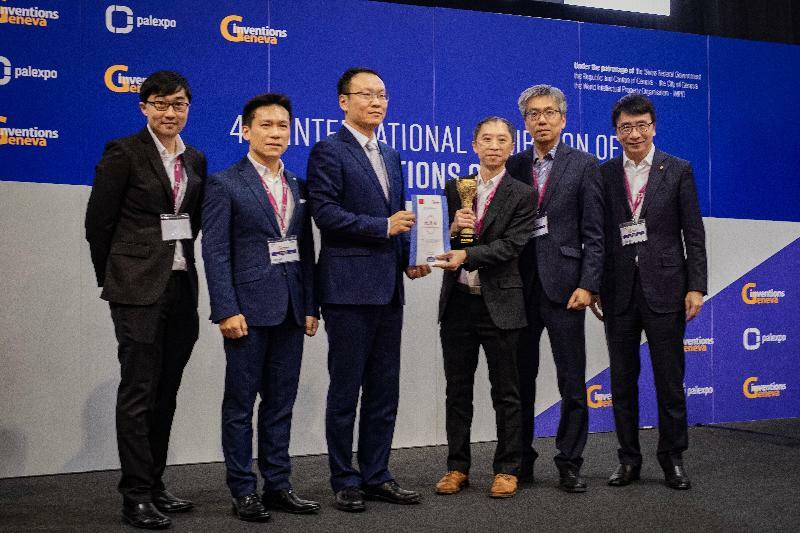 Following the winning of the Gold Award of the Hong Kong ICT Awards 2019 – Smart Mobility Award (Smart Transportation Stream) last week, the intelligent robotic system, the development of which was initiated by the Highways Department (HyD) and which was co-invented and successfully built by the HyD and the Hong Kong Productivity Council (HKPC), was awarded the Honorable Mention Prize of the Chinese Delegation for Invention and Innovation and a Gold Medal with Congratulations of the Jury at the 47th International Exhibition of Inventions of Geneva in Switzerland yesterday (April 12, Geneva time). Held annually, the International Exhibition of Inventions of Geneva has been recognised as the most important innovation and technology exhibition of its kind in the world. It attracts exhibitors from around the globe including business enterprises, research institutions and universities to put their inventions and innovations on display. Held between April 10 and 14, this year's exhibition has attracted over 800 exhibitors from over 40 countries and regions presenting more than 1 000 inventions. The HyD and the HKPC jointly presented at the exhibition the co-invented intelligent robotic system, which is the first of its kind in the world fitted with cameras, sensors and robotic arms to understand its surroundings with full cognitive abilities for placing and collecting traffic cones and lanterns on public roads. The HyD always attaches great importance to safety in road works, accords first priority to the safety of engineering site staff and has been striving to enhance safety protection for carrying out road works on public roads. Given that the engineering site staff may face higher risk when setting up and collecting traffic cones and lanterns on public roads late at night, the HyD has therefore been studying the use of advanced technology to adopt an automated approach to replace the engineering site staff in carrying out relevant works under more dangerous situations in order to protect their safety. To this end, the HyD and the HKPC have co-invented the automated intelligent robotic system suitable for use under the road conditions in Hong Kong, and are currently carrying out detailed design for the formal application of the intelligent robotic system in road works. Upon completion of design and assembly, site trials will be carried out with a view to commencing its use on public roads in the near future.